There are a ton of great headphones out there, but if you’re looking for a pair of headphones you can take running or to the gym, you’ll likely want a pair of dedicated sports headphones. Why? Well, other headphones could easily fall out of your ears or move around during your workout, which is less than ideal if you’re trying to focus on other things. Thankfully, there are some great options out there for sports headphones, whether you want a pair of in-ear headphones or even on-ear headphones. Here are the best sports headphones money can buy. There are a ton of sports headphones out there, but if you want the best of the best, then the Jaybird X3 is probably the pair of headphones for you. Not only does it stay nice and tightly in your ear, but these headphones also sound pretty darn good — which is always nice for a listening device. While the headphones are generally comfortable and well designed, the best thing about them has to be the fact that they sound great. Not only do they sound pretty good out of the box, but the accompanying app also allows you to control the frequency response of them — so you can tweak the sound to perfectly match your preferences. So, if you want some nice pumping bass for your workout, it can easily be achieved — while if you want something slightly more natural you can get that too. They’re also pretty comfortable, and they come with quite a range of accessories — including memory foam tips. That helps create a much better seal, which is not only good for keeping the headphones in your ears, but also helps create a much better sound quality. True wireless headphones may be great, but they still struggle to properly stay in your ears — and as such they’re not always the best choice for sports. 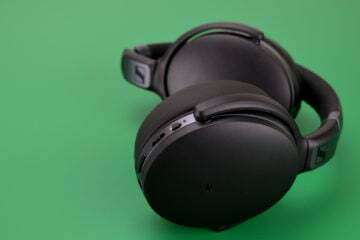 JLab Audio, however, has a solution to that, with the JLab Epic Air Elite headphones — which have a great fit and a nice ear hook to ensure that the headphones properly stay on. Comfort level isn’t the only great thing about the JLab Epic Air Elite headphones — they headphones also boast a great sound quality, and a nice long 6 hour battery life, which is helpful for those that plan on working out for a long time. They’re not too pricey either — coming in at $150. JBL has a history of delivering excellent-quality headphones, and in partnering with Under Armor for the JBL UA Sport Wireless Train headphones, the company has come out with a great choice of on-ear headphones for sports. The headphones feature a nice tight clamp, so they shouldn’t easily fall off your headphones, plus they sounds pretty great too. The headphones are built for sports use, and as such they boast plenty of bass, which is perfect for those who need an extra kick in their workout. It also offers relatively well-tuned mid, and a clean high-end. Many consider wireless headphones the better choice for taking running or to the gym — but if you’re willing to put up with a wire, then you could save a bit of money and get an amazing pair of headphones in the process. V-Moda has been on a roll of late, building not only great over-ear headphones like the Crossfade 2 Wireless, but also great in-ear headphones like the V-Moda Forza Metallo. The Forza Metallo is built to sound amazing, but they’re also designed in such a way that they stay in your ear pretty well. That’s largely because of the included sports wings and ear tips, allowing you to find the perfect combination of accessories for your ear shape. They’re also very well-designed, which we always appreciate. Sometimes you may want your sports-focused headphones to do a little more than just play back music. Sometimes, for example, you may want them to also track fitness metrics like your heart rate. If that’s you, then a great choice is the JBL Reflect Fit, which not only offer a pretty good design and sound-quality, but also track your heart rate. Another thing that we loved about these headphones is their overall design. While they are built with a neckband style, that neckband isn’t loose enough to move around a lot during your workout, nor is it tight enough to strangle you. The controls are generally pretty easy to use as well, and while there are quite a few of them, you should get used to them relatively quickly. All of the headphones on this list are great, but they’re all relatively expensive. If you’re looking for a great pair of sports-focused headphones and don’t want to spend more than $100, then there are still some great options — like the JLab Epic2 headphones. These headphones are built to offer a great sports experience. They feature a hook design to keep them in your ear, meaning you won’t have to worry too much about adjusting them a lot during your workout. They also sound pretty good — while some extra highs would be helpful, they offer plenty of bass, which is extra helpful during a workout. They also look great and remain relatively comfortable. Best of all, they come in right under the $100 mark.